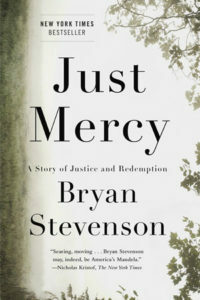 Bryan Stevenson’s Just Mercy is one of those books that every functioning adult should read. To say this book had an impact on me is selling it short. Without a doubt, it is the book I recommend the most to people. Here’s the author’s site about the book. Stevenson has a no-nonsense way of presenting the facts, the story and his point of view on all of it. Maybe it’s his training as a lawyer. Maybe it’s his up bringing. Maybe he’s just thought about race, relations, the law, the South, poor people, or history more than anyone else and has been mired in the good and the bad since he first went to work. Just Mercy shines the light on the injustice (true injustice) that goes on these days. I won’t take the time to spout trends and numbers at you, but the real world (and recent!) story Stevenson shares about wrongly imprisoned people will wake you up. These things are not from the 1950’s, they are current issues. I have to admit that when I first heard of Stevenson’s and the Equal Justice Initiative’s plans for a memorial on lynching – I didn’t get it. I honestly didn’t. But now that I’ve read his book, I totally get it. Regardless of your experience with the law and race issues, regardless of your stance and opinions, regardless of what you think of poor people – this country must talk about it. We must listen to each other and decide what’s best for everyone. Just Mercy is the best place I know of to get started. I hope you will take the time to give this book a read. Five out of five stars and I’m recommending this book to anyone with a heartbeat. These days the celebrity memoir is usually soething to be avoided. 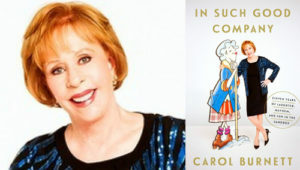 However, Carol Burnett’s In Such Good Company is a breath of fresh air to the category and one not one for fans to miss. I grew up watching the Carol Burnett Show with my family and there are a still a handful of lines that get mentioned and quoted at various family events. Some of the sketches from the show have achieved iconic status and it was fun to read the stories behind these moments. The book reads almost as if Carol herself stopped by the house for a visit and is just swapping stories. Because, if you watched the show, you will remember every episode, every character and every actor she brings up. I’m not sure what the difference is between this show and the funny shows I watch on tv these days. I mean I still laugh at what’s on, but while I was reading In Such Good Company I was smiling so big and laughing at just the memories of laughing. I have to admit, it was a little weird, but so good. The book was really about the show and stories behind the episodes they did. So there’s no ‘tell all’ or drama or gossip, which is quite refreshing. It’s charming, classy and full of memories. 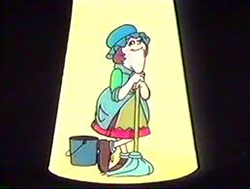 I don’t think they make television stars and personalities like Carol Burnett anymore, which is a shame. I’m glad there are re-runs and I’m glad to have read this book. I know a few folks in my family that will enjoy it too. I am very thankful for having read this Life on the Edge. And 100% of that thanks goes to the authors. While I can not say I agree (or even understand) everything they brought forth, they did so in a very “common sense” manner that I appreciated. 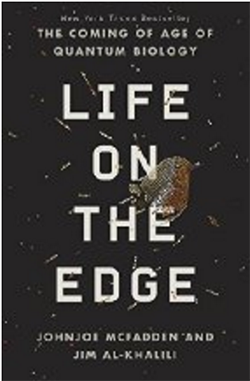 At times, when reading Life on the Edge, it felt more like a conversation than a lecture. Which is not how a lot of science books I pick up often feel. They both must have a natural knack for explaining things. And even though their own certainty and mastery of the subject is apparent (and well researched) their sense of wonder of the biological systems and bodies around them still comes through their writing. Quantum physics, quantum effects, quantum mechanics seem to be ingrained not only in our physical universe but also through all of nature and biology. The passages about the brain and neurons and the whole system is very fascinating. I was surprised how much ink was spent on the “why” of the ideas in the book. That is until I fully realized how new and forward thinking their ideas are. Hopefully others will write more in this area as new discoveries are made. I have a new appreciation for nature and all of the amazing too-small-to-see processes that happen. Processes that labs can’t replicate. Processes that scientists can witness but not explain. All very very cool. I still have tons of new vocabulary words I need to look up. I give this book three out of five stars and am recommending to every one I know that has read folks like Bill Bryson and Bryan Greene. Well, another year is in the bag. My year finished fast and great. I hope yours did too. Right around the end of the summer life put its foot on the gas and it took off with a roar, but thanks to the folks at work, my family and some wonderful book finds, I’m feeling good heading into 2016. I just wanted to share a few highlights and recommended reads. If you get the chance, please share something you read this year that you think I’d enjoy. I’m always looking out for something new-to-me. if laid end-to-end, these pages stretch 0.0003% of the distance to the moon. and, the value of their weight in gold is currently $203,351,975. Also, if stacked on top of each other (end-to-end) then my 2015 list would be taller than Stonehenge. That’s a pretty good year for me. I also track where I “first heard of a book”. I’ve been doing this for a couple of years and it’s the first time that “Podcasts” came in at #1. “From Friends” dropped to #3 and “Blogs” is #2. I think this means I need to get out more. I was also a very “current reader” as (when averaged) most of my books were only 2 years old when I read them. This is something I’m going to change in 2016. Without a doubt the best book I read this year was Bryan Stevenson’s Just Mercy. It impacted me more than anything else I read and it is the book I most recommended last year. Anyway, please share any 2015 finds you had. And most importantly – Happy New Year to you and yours!